After installing the Knights of the Nine, while traveling the expanses of Cyrodiil to your hero may soon reach the rumors about the tragic accident in Anvil. Someone attacked the Chapel of Dibella, all the priests and visitors inside, were brutally murdered, and the church itself - is defiled. Forwards, thus, no one saw how they could sneak past the guards - also remained a mystery to most. According to rumors, shortly after the event at the church a mysterious prophet who preached the imminent coming of evil. You will have to go to Anvil and by all to understand. Arriving on the scene, soon notice preaching all day at the church of the Prophet. After talking to him about the attack on the Chapel of Dibella know that this is only the beginning. Behind all this is Umaril - ancient Ayleid king who was defeated Pelinal Whitestrake, associate Alessia, as far back as the First Era. But Umaril survived, his spirit was associated with the kingdom of his patron saint - Meridia and now he returns to take revenge on the gods who helped Pelinal in its affairs. Now Umaril can stop only one thing - pure heart knight, armed with holy relics of the Crusader - weapons and armor Pelinal. When the Prophet will ask you whether you are a worthy knight, is to answer no. Only after that Prophet continue a conversation with you and say that the search for the sacred artifacts must begin with a pilgrimage. For those who are mired in the past evil deeds, it is the only way to clear the gods. Prophet will give you a map that indicates where the main road nine shrines near which should give the prayer. Only after the pilgrim path may begin your search of holy relics. So, following the map, it is necessary to reach the place of all road shrines and pray near them. After the prayer will be made at the last sanctuary, soon you will visit the vision itself Pelinal Whitestrake call you to him. During the pilgrimage, you may encounter Sir Roderick, who is also in search of holy relics. You can visit any road sanctuary, not necessarily the ones that are listed on the map. After committing the Pilgrim Path your notoriety will drop to zero. In your vision, you will be in heaven over the Imperial City, and next to you will be a ghost of Pelinal Whitestrake, which tells you about his sad fate. When he will cast Umar rest Ayleids able to overcome Pelinal and tore his body into eight parts. After this event Pelinal mind was in a fog, so he could not tell where his relics, but he will be able to specify the location of the tomb, built by his colleagues directly to the place where Ayleids bullied him for the last time. After the vision stop on your card will be marked entrance to the tomb - not far from the Imperial City. Entrance to the cave under water, although it is possible to do without water breathing potions - swim to be small. Inside the caves inhabited by a bunch of Ayleid undead. 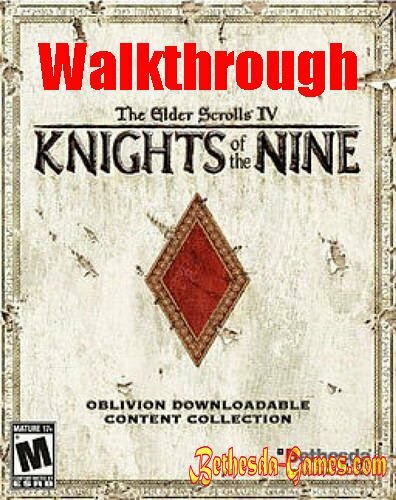 Breaking through them to vaults Ayleid ruins, soon find late Sir Amiel. Right from his corpse on a hill visible Crusader Helmet resting on the altar. With body Amiel should take the key from the gate overlapping path to the helmet, as well as a diary and signet ring necessary for further searches. We pass on directly to the door that leads into the corridor leading to the helmet. The door to the left of Sir Amiel - a way out of the ruins. Shortly after passing a little more into the underground, we will be near the altar, which is one part of the holy relics - Crusader helmet. In order to know where to find the rest of the relics have read the diary of the late Sir Amiel. From it we learn that Sir Amiel was a member of the Order of the Knights of the Nine, has made it his aim to find the Relics of the Crusader, his successes in these matters, as well as the subsequent sad decay of the Order. And also learn that one of the relics, which Sir Amiel once considered his property, Crusader Breastplate, is still in the abandoned Abbey Nine, located somewhere in the depths of the Western Veldt. After reading the diary, the location of the Abbey will be marked on your map. Go there and on arrival find long-abandoned abbey, which has been 300 years since no one appeared. The house, on the ground floor on the floor is patterned emblem. It is necessary to insert a signet ring Sir Amiel, then it turns out that it's a secret staircase leading to the cave under the abbey. Down there on the podium, the second rests sacred relic - Crusader Breastplate. However, not everything is so simple once you walk a couple of steps towards the cuirass around you have spirits, the members of the dissolved Order of Nine, Sir Amiel headed. After death, they are doomed to do what could not be done with life - to protect holy relics from the unworthy, and to recover it, you will have to prove that you are worthy knight. To do this in a fair fight, one on one, to defeat each of the ghosts, of which only eight. After the last opponent will be defeated - the ghost of Sir Amiel, deceased members of the Order deem you worthy knight and will now freely take Crusader Breastplate. It remains only to find out where the rest of the holy relics that were once in the possession of some members of the Order of Nine. For this purpose will have to talk with the ghosts of the Knights of the Nine. The ghost of Sir Berwick, Leggings and appropriated the sword among the rest was not. These relics are found in the least. To find out where the gloves Crusader should talk with the ghost of Sir Casimir. He will tell you that after the collapse of the Order he went to war the Red Diamond, taking the gloves with him. The war changed him, after his return he could no longer serve as the Nine earlier. Once, when Casimir was in the chapel Stendarr in Chorrol, in a fit of rage, he hit a beggar every day come to the chapel, and killed him instantly. This act committed in the Church of God of Mercy, made his mark. Gloves come off with Sir Casimir and fell to the floor, overflowing with such severity that now no one is able to budge. And the Sir Casimir and all his family was cursed eternal fatigue. Go to Chorrol and there, in the chapel of Stendarr on the floor of the sought gloves. However, they can neither raise nor even budge. After talking with the priest Areldurom, we learn that the gloves are here for many years. He also tells that the chapel had recently arrived Kellen - a descendant of Sir Casimir, who had lost his gloves here. Go to the hall of the chapel, where we find the leisure Kelly. From him we learn that he came here hoping to break the curse, gravitating over his native for many years. But when talking to Areldurom Kellen feels that he is hiding something from him, if he feels somewhat guilty. Redguard ask us to talk to him about it. Go back to Arelduru and talk to him about Kellene, we learn that Areldur knows a way to break the curse - is to take it on. However Areldur afraid to do it, he could not gather the courage to help Kellenu, taking in their line of his curse. He says that if we want to help him, then have to pray at the altar Stendarr to the given forces able to remove the curse from Kelly. So, pray at the altar, and then receive a special spell, back into the hall and kastuem it to Kelly. Curse lifted, but now we have it, because of what a hero is now recovering fatigue worse. Mercy is done, now you can safely raise and appropriate the gloves Crusader from the floor of the church. repenting of his indecision, Areldur go to the Abbey to serve the Order and Nine. To find out where the boots have to talk to the ghost of Sir Dzhunkana. Ghost tells that during his lifetime he was trying to find boots Crusader, but his search did not come to fruition. He will say that the search should start with the sanctuary of the goddess of air - Kynareth located in the forest, to the west of the Imperial City. Upon arrival to the shrine and talk to priests, know that the boots are in the possession Kynareth and get them the only one who can pass her test. To do this, go to the sacred grove and there Kynareth fulfill its precepts - fear and respect nature. Grove is close to the west of the sanctuary. Arriving there, we can only wait for messages from Kynareth. And soon it will appear. In the grove would be a brown bear and immediately begin to attack you. You must not have a resistance to it, otherwise the test will fail. You can depart from his blows, the main thing is not to run out beyond the trees. After a while, the bear will calm down and leave you alone, but also opens the entrance to the hidden cave, located in the grove. Inside there are Crusader Boots - another part of the holy relics found. one of the priests, Avita spring, will join you in the Abbey after finding boots. To find out where the mace Zenithar have to talk to the ghost of Sir Relvasa. He'll tell you that, according to legend, when Pelinal was defeated, the village people, located in what is now to be Leyaviin, a messenger arrived with a mace as a message. True or not, but after the Millennium Holy Kaladas built in Leyaviine Zenithar chapel as a tribute to the legend. When he died, he was buried in a tomb in the church and everyone who prayed near his grave, had visions mace. Sir Relvas tried in his visions hundreds of times to reach this mace, but he could not. He could not jump over the crevice, embodying doubt. Relvas say that only faith can carry out a way to mace. So, go to Leyaviin to church and there we meet Karodusa Oholina, Knight, who came in search of mace. However, he failed in his visions and now made a commitment to protect the church. Go to the catacombs (which, incidentally, is haunted), there are the graves of Kaladasa and pray over her. Coming soon vision, your hero is in the ruins of the castle, floating in the void. But between the mace and the platform on which you are standing is a big gap. To pass it, it is necessary to wear boots Crusader, obtained a job Kynareth, and then there will be the road on which you can easily get to the clubs. When you grab her vision will disappear, but the club will remain with you. Well, another relic in your hands. However, not all so simple. Coming out of the dungeon, you'll see that the Church attacked. You have to repel the attack Avroranov - Daedra from the realm of Merida, servants Umar. After defeating them Zenithar Church will be saved from desecration. Karodus Oholin, after reflection attack willingly join in reviving the Order of the abbey. If you ask about the ghost of Sir Relvasa Zenithar, he will tell you that the scope and Kynareth Zenithar interrelated. Artisans who patronize Zenithar use the gifts of nature Kynareth. After that, it becomes clear why for clubs, you must first acquire boots. To find out where the shield Crusader should talk with the ghost of Sir Henrik. He will tell you that after the collapse of the Order, he went in search of a shield and succeeded in doing so. He carried a shield in Fort Bulwark, which with a few companions created a trap that no one was able to find and abuse the power board. And so he died protecting shield against intruders. Fort Bulwark, where the shield is located on the south-east of Cyrodiil in the Black Forest. Go there and find that the fort had already chosen by a group of magicians who also want to look for the shield. Inside the fort you have to battle with the sorcerers and Daedra, they called to his aid. Making his way through the dungeon in one of the rooms with wizards, where the lever to open the door, you may find a note on the progress of the search, which will help you pass the first puzzle. So, soon, opening all doors and erecting bridges, you will go to the corridor with 12 plates, arranged in four rows of three, and a locked gate. To open them, you need to pass on one plate in each row. You can use the tip and pay attention to standing next to a candle, and you can try to go "at random". In any case, any problems it does not deliver, and you will be in the next room. This dungeon. In one of the chambers sits locked knight - Sir Tedret, which caught the magicians in the hope to get a solution to the next puzzle. Release him, and he will tell you about the tip - you need to look custody was lined with you, and only if Julianos help you. Continue to move into the underground fort, facing the sorcerers, and reaching the next trap - the bridge, looping through a hail of fire darts. Passing this bridge, coming soon to a large room with a statue Julianos and several small statues, standing in the center of the district. Having finished with a couple of magicians, let us solve the puzzle. To do this, you have to turn all the statues so that "their eyes" staring at the center, which should be your hero. Then the lights go out, and opened the door leading into the next room. Magicians no further slipped, and in the way between you and the shield is the last mystery. You will soon find yourself in a large room, the walls of which there are statues and chests near them. In the center of the room is a chest on the stairs, inside which you will find one of the subjects Rodgara. When you step on the tiles around the chest after taking from it the subject of one of the chests near the statue will prompt - some of the items to be put there. Thus, it is necessary, removing one item, put them in the appropriate trunks. If the trunk is put the correct thing, he begins to glow a bluish glow, if not - will have to try again. When all of the items will be laid in its place, a secret door opens, I will bring you into the room where the rest of the Crusader Shield. Thus, one of the holy relics in your hands. It remains only to leave the fort and return to the Abbey. After the liberation, sir Tedret join reviving Order. 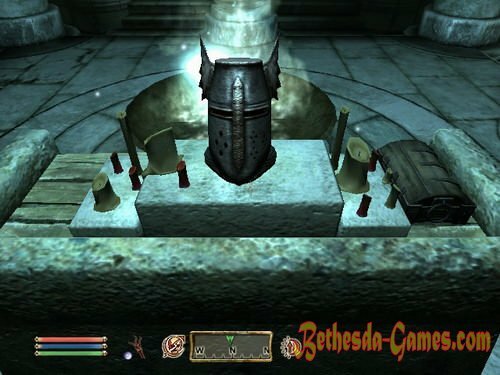 Once you're on a tip spirits orders, collect all the known parts of the Relics of the Crusader, except greaves and sword, should return to the Abbey. There you will be expected to Luton - squire Sir Roderick, with whom you may have encountered during the pilgrimage. He will tell you that after the pilgrimage ghost of Sir Roderick Berwick spoke with to release him. Soon Roderick and Luton Anderpall found a cave, which is actually buried fortress. There Sir Roderick and found his death, he was killed by the ghost of Sir Berwick. Luton managed to escape, taking with him Leggings Crusader, which he will present to you and. However, the sword remained in the possession of a ghost. It is necessary to go back and pick up the sword. You can take with you on a journey Latona, and you can leave it in the abbey and get your own sword. shortly after this quest will talk about the attack on the Church of Mary in Bravil. It is time to return to the last relic, which is now dominated by the ghost of Sir Berwick. Go to the buried Anderpall fortress, located near Broome. Inside the cave to fight with the undead. Broke through their ranks, in the depths of the castle soon you run into the ghost of Lord Berwick Vlindrela, armed with a sword Crusader. Having won in battle nonweak ghost, you take possession of the Sword of the Crusader, the last of the holy relics. But the blade was desecrated by evil, so if you use it now, you will fall a curse. Sword must rededicate the temple arch which is located in Cheydinale. Go there. However, upon arrival it turns out that you're a little late. The church has already raided, all the priests killed and avrorany willing to desecrate the altars arch. It is necessary to prevent them from doing so. For this purpose it is to kill all zlatokozhih Daedra. After last avroran defeated, church Arkay will be considered saved. It now remains only to consecrate the altar of Arkay sword and return to the Abbey to prepare for the ultimate showdown with Umarilom. After you kill the ghost of Sir Berwick, his spirit, freed from evil, will be in the dungeons of the estate with the rest of the spirits of the old order. If you have installed Ltd. v 1.31, in the dungeon Anderpall you will wait for a surprise. Upon arrival at the Abbey donesut you that during your absence here was the Prophet and he is now broadcasting in a small chapel of the Abbey. You must go there and talk to him. The prophet tells you that you - the embodiment Pelinal Whitestrake and that the time has come to meet Umarilom face to face. 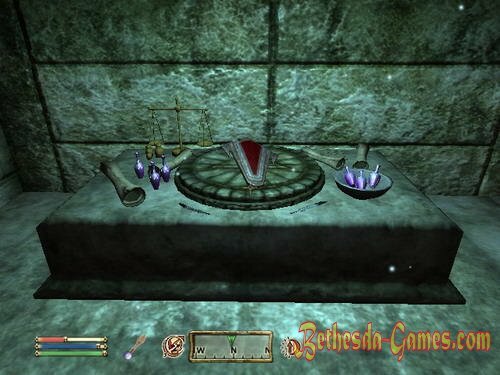 To do this, he will give you the last missing piece - the blessing of Talos, also known as Tiber Septim, managed after his death, to achieve divine status. This blessing will allow you to travel in Gray Nothing for Umaril spirit and drive him out of this world once and for all. But for this you first need to destroy his corporeal shell. in the chapel are new recruits, who decided to join the revived Order. Should be devoted to them and also knighted. So, the time has come for a decisive battle. 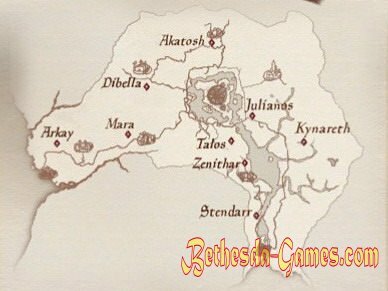 Umaril chose its base ancient Ayleid observation outpost, located in the far west of Cyrodiil Sea off the coast of Abyssinia - Garlas Malatara. Upon arrival to Garlas Malatare soon the approaches and all the other knights, which you had to build the Order of Nine. If you take each - a whole bunch of people come running, which will easily shred avroranov inside the fortress. If not - then you come to the aid just a couple of people. Now you and your knights can only go to storm the halls Garlas Malatary destroying avroranov in its path. Soon you will come to a large room where the throne hall Umaril separates you only impermeable barrier and avrorantsy indestructibility. After death they are raised, and again rush into battle, do not waste time on them. 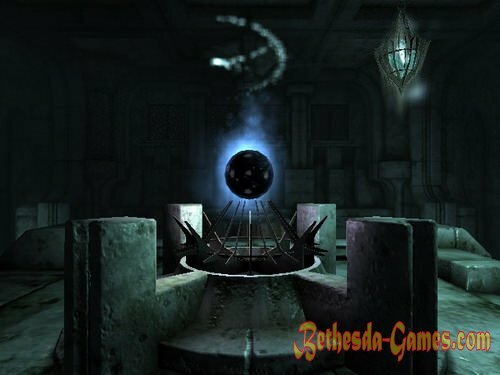 The source of their power - the big blue sphere, you must climb up and activate it. Then she would break into a bunch of small fragments, frozen in the air barrier to advancement to the throne room to fall, and avrorany and knights disappear. Way back too fenced. It remains to go to the throne room, where he will meet in the decisive battle with a renewed Umarilom, which because of its unnatural nature has become more like a avrorana than Ayleid elf. Defeating him in battle, it is necessary to use on themselves blessing Talos, and then your mind will follow Umarilom. Now we have to win it again, this time in terms of the spiritual, high in the sky above the Imperial City. After the final victory over Umarilom your spirit will rapidly return to the ground ... and soon you will find yourself in the dungeons of the Abbey of Nine. Ghosts say that you have completed your mission, the Order restored relics collected, while Umar defeated, and now they can safely leave this world and go to the Aetherius. Soon will come running to the dungeon Sir Tedret and talk about what your lifeless body was found near the Umarilom. Finding you dead, they dragged your body in the cave abbey, hoping to keep secret the death of the Holy Crusader. Tedret not will wait to report your resurrection and the final defeat of Umaril other knights. Nine enemy is defeated, and the Knights of the Nine restored to its former glory of his. If you subsequently gained notoriety, you can no longer wear Relics of the Crusader. To save yourself from sin, you must again pass Pilgrim on all road sanctuaries and cleanse themselves of sin, only then will you be able to wear again Relics.